I quite often have a "lucky feeling" when I sit down to play my favourite online slots. That feeling doesn't necessarily translate into a winning night though -- like it did for a player at Jackpot Capital Casino the other night! 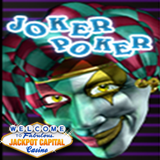 The 64 year old player had a $20,000 winning streak playing Joker Poker video poker. The winner is a Platinum VIP player at Jackpot Capital, so she gets exclusive bonuses and lower wagering requirements. VIP players also get lightning fast payouts and very personalized service. But even if you don’t wager enough to qualify for VIP status Jackpot Capital will still treat you like a VIP with Comp Points that can be converted to cash. Mobile casino players and Game of the Month players earn double comp points. There’s still another week left in Jackpot Capital’s summer tablet giveaway. Every weekday until August 15th one randomly selected player will win a Google Nexus tablet, perfect for enjoying Jackpot Capital’s mobile casino (iPhone, iPad, Samsung Galaxy and Google Nexus enter m.jackpotcapital.eu in their smartphone or tablet’s browser to access the mobile casino games). The $100,000 Reels on Wheels casino bonus event (http://promotions.jackpotcapital.eu/casinoreels) continues until August 24th.